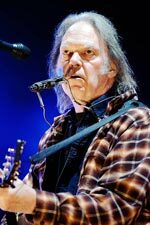 Neil Young's uncompromising approach to sound quality has been a source of some aggravation to some of the people he's recorded with, but it has impressed the Recording Academy Producers & Engineers so much that the organization will honor him during a ceremony during Grammy Week in LA. The January 21 event at the Village Studios will honor Young for what Recording Academy President and CEO Neil Portnow calls being '...tireless in his own efforts to draw attention to the importance of hearing music as the artists who created it intended'. Given Young's general indifference to awards and his irreverence when he does show-up to receive one, we have to give the Academy some credit for the decision to choose Neil.